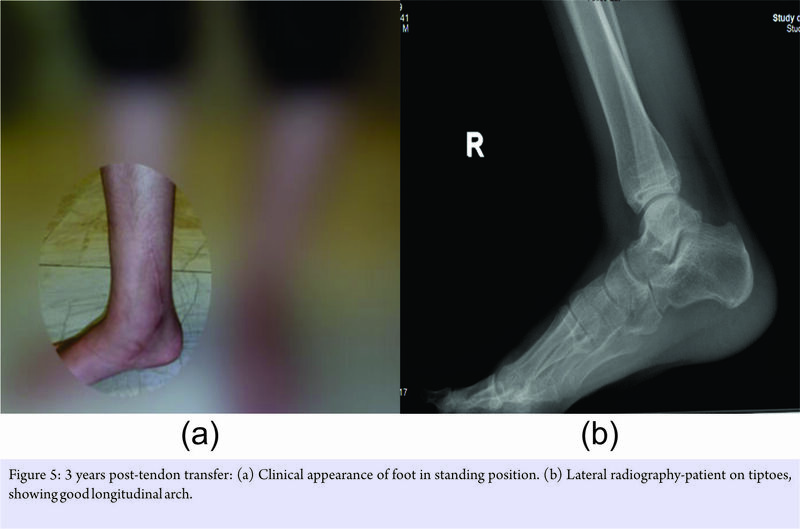 Unilateral flat-foot from unrecognized old TP rupture in a child can be effectively treated with FHL transfer to restore longitudinal foot arch. 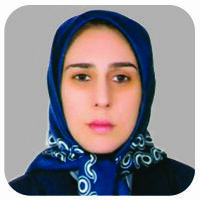 Department of Orthopaedic, Bone and Joint Disease Research Center, Shiraz University of Medical Sciences, Shiraz, Iran. Department of Orthopaedic, Chamran Hospital, Chamran Blv., Shiraz, Iran. Case Report: A 10-year-old girl presented with unilateral flatfoot and unusual shoe wear of few years duration. A TPT rupture was diagnosed. After observing a 3–4 mm superficial scar behind medial malleolus, and after a lot of questioning, her mother remembered an abrasion she had sustained 6 years ago playing in a park. She was successfully treated by flexor hallucis longus (FHL) tendon transfer and obtained and maintained a nice longitudinal arch. Conclusion: TPT rupture in children may happen by a minor laceration or trauma and be only recognized after developing flatfoot. FHL tendon transfer can restore the arch even in late cases. Keywords: Flat-foot, Tendon transfer, Tendon injuries, Posterior tibial tendon dysfunction, Child. Tibialis posterior tendon (TPT) is an important component of the longitudinal arch of the foot and functions as a primary invertor and plantar flexor [1, 2]. It shifts the center of foot pressure more anterior when one starts the push-off during a gait cycle . Tibialis posterior locks the midfoot bony arch as well as the hind foot, providing stability at the time of heel-off . Rupture of TPT is more commonly reported in the older age population from attritional changes in the tendon [4, 5], or even following medial malleolus fracture . Traumatic injury of the TP in the pediatric population is rare. The unrecognized rupture, with the late presentation as flatfoot, is even more uncommon . A 10-year-old girl was referred to the pediatric orthopedic clinic with a right foot deformity which had started at age 4 and had slowly progressed. The parents were certain that the child had symmetric feet shape from birth. There was no history of a similar deformity in the close or distant family members. There was no family history of any neuromuscular disorder. The physical examination revealed plantigrade feet, with a distinctly right flatfoot with a well-formed longitudinal arch on the left side (Fig. 1). There was no evidence of spine anomaly, peripheral neuropathy or myopathy. The right foot examination showed intact sensation, and full power in all the muscles, except for the inversion power which was weaker than the opposite foot. On closer inspection of the foot, a small scar of about 3–4 mm was visible just posterior to the medial malleolus. On further questioning of the parents, they remembered their daughter having cut herself on a piece of rock playing in a park at age 3. This did not require any medical attention and apparently healed uneventfully in few days. This piece of history led to the further investigation including a magnetic resonance imaging of the leg which showed the absence of TPT at the ankle level, and atrophic muscle. Surgery, through a slightly curved medial foot and ankle incision, showed a fibrous stump of old TPT on the navicular tip. There was no evidence of TPT. The atrophic muscle was, however, found some 12 cm proximal to the medial malleolus with no visible tendon end. A reconstruction with the flexor hallucis longus (FHL) tendon was planned. The incision was extended distally, the “Master Knot of Henry” – the fibrous slip that envelope the FHL and the flexor digitorum longus (FDL) tendons – was exposed. The FHL was cut at that level, and proximal end was transferred to the navicular bone and tightly sutured to bone and remnants of TPT. The distal stump of the FHL was tightly sutured to the FDL (Fig. 2 and 3). Following 6 weeks of cast immobilization a course of physiotherapy was started (Fig. 4). The longitudinal arch was restored and has remained nicely intact up to the last visit 3 years post-surgery (Fig. 5). The patient has a pain-free motion of foot, ankle, and toes, and is satisfied. The push off is strong, and she shows very nice longitudinal arch when standing on tiptoes. She could do repeated push off exercise on tiptoes with similar power and foot-arch shape as the opposite foot, without any fatigue. TPT, along with the bony structures and the ligaments of the midfoot, helps to maintain the longitudinal arch of the foot. The inverter function of this tendon is counterbalanced by the peroneus brevis. The insufficiency of the tendon can result into a planovalgus foot deformity. The rupture can go undiagnosed as the toe flexors and tibialis anterior can compensate for the inversion power of the foot . It is usually the late appearance of a flat foot that draws attention to this insufficiency. Citron reported on 2 cases of TP rupture in older children, presenting couple months later with symptomatic flat feet . The repair had been done with direct repair in one, and with residual paratenon and plantaris graft augmentation in the second case. This second patient required later re-exploration. Direct repair, few months post-injury, was also reported by Abosala et al. . That one also needed re-exploration due to weak inversion. These two reports would indicate that direct repair, even if technically possible, may not be a good choice of treatment few months after the rupture. Masterson et al. reported on three such cases in 1994, 2 of whom were secondary to sharp glass injury and the third one from an unrecognized old injury. All three had been treated similar to our case with the transfer of FHL. The distal stump of FHL had been also attached to the common toe flexor tendon. TPT rupture and treatment with tendon transfer have been extensively explained by Mann in adults . Mann and Thompson and Marcus and Pfister both reporting on adult population had often used FDL tendon transfer for the ruptured TP [4, 5]. Our case was seen few years after the injury, the muscle had retracted back to mid-leg level, and no remaining tendon could be identified. It is best treated by FHL tendon transfer which is a larger and stronger tendon in comparison with FDL . Attaching the distal end of FHL to common toe flexors also provided a very effective big toe power for push off. Late development of flat-foot in children can be from an unrecognized TPT rupture happening by a minor laceration or trauma. FHL tendon transfer can restore the arch even in late cases. Pes planus in a child when asymmetrical should be thoroughly investigated for the possible neurological cause. In the absence of any such finding, a careful evaluation for any old minor laceration should be done. Surgical treatment of even an old flat-foot resulting from TPT rupture is warranted. 1. Basmajian JV, Stecko G. The role of muscles in arch support of the foot. J Bone Joint Surg Am 1963;45:1184-90. 2. Foster AP, Thompson NW, Crone MD, Charlwood AP. Rupture of the tibialis posterior tendon: An important differential in the assessment of ankle injuries. Emerg Med J 2005;22:915-6. 3. 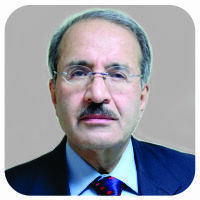 Imhauser CW, Siegler S, Abidi NA, Frankel DZ. The effect of posterior tibialis tendon dysfunction on the plantar pressure characteristics and the kinematics of the arch and the hindfoot. Clin Biomech (Bristol, Avon) 2004;19:161-9. 4. Marcus RE, Pfister ME. The enigmatic diagnosis of posterior tibialis tendon rupture. Iowa Orthop J 1993;13:171-7. 5. Mann RA, Thompson FM. Rupture of the posterior tibial tendon causing flat foot. Surgical treatment. J Bone Joint Surg Am 1985;67:556-61. 6. 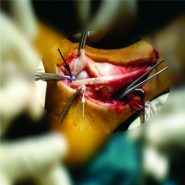 West MA, Sangani C, Toh E. Tibialis posterior tendon rupture associated with a closed medial malleolar fracture: A case report and review of the literature. J Foot Ankle Surg 2010;49:565, e9-12. 7. Masterson E, Jagannathan S, Borton D, Stephens MM. Pes planus in childhood due to tibialis posterior tendon injuries. Treatment by flexor hallucis longus tendon transfer. J Bone Joint Surg Br 1994;76:444-6. 8. Citron N. Injury of the tibialis posterior tendon: A cause of acquired valgus foot in childhood. 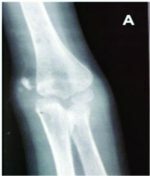 Injury 1985;16:610-2. 9. Abosala A, Tumia N, Anderson D. Tibialis posterior tendon rupture in children. 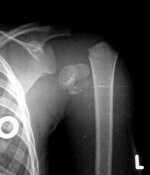 Injury 2003;34:866-7. 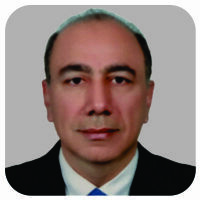 How to Cite This Article: Shahcheraghi GH, Javid M, Chabok SK. Acquired Flat-foot in a Child (Report of a Case). Journal of Orthopaedic Case Reports 2018 Jan-Feb ; 8(1): 64-66.